US President Donald Trump is on an official tour to several Asian countries amid the ongoing Korean Peninsula crisis. 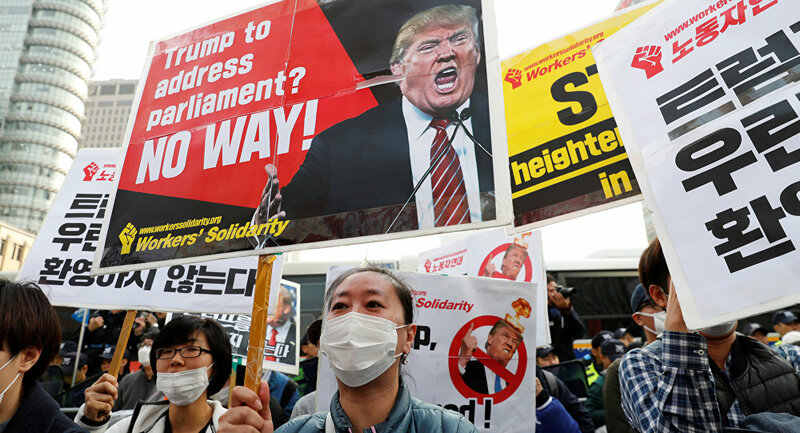 MOSCOW (Sputnik) — Hundreds of members of liberal activist groups, calling themselves "Collective Action for 'No Trump," have gathered in the center of Seoul to protest against US President Donald Trump’s two-day visit to the country, the Yonhap news agency reported on Tuesday. The demonstrators have accused Trump of escalating tensions on the Korean peninsula with his provocative rhetoric, forcing South Korea into buying armaments and attempting to renegotiate the free trade deal between the two countries. The protesters are planning to hold a candlelight vigil starting at 7 p.m. local time (10 a.m. GMT). Local police have reinforced security measures, set up barriers and deployed additional officers in the central area of the capital, especially near the presidential residence, the Blue House. Several religious clerics reportedly made pilgrimages in a protest against the deployment of the US Terminal High Altitude Area Defense (THAAD) missile defense systems in South Korea, but were stopped by the police when they headed to the presidential residence. Proponents of Trump’s visit to the country have also taken to the streets of the South Korean capital, hailing the alliance between the two countries and calling on the US president to visit the Demilitarized Zone (DMZ) between North and South Korea, even though the White House said in late October that a trip to the DMZ was not on the president’s schedule. Earlier in the day, Trump landed at the Osan Air Base in the South Korean city of Pyeongtaek and headed to the US Army Camp Humphreys garrison, where he was welcomed by the troops. After the visit to South Korea, the US president will travel to China and Vietnam, where he will join the Asia-Pacific Economic Cooperation forum and will finish his journey in the Philippines on November 12-14. Trump previously criticized the 2012 US-South Korean free trade agreement, calling it horrible and unacceptable. In late June, Trump instructed US Trade Representative Robert Lighthizer to start renegotiating the current trade agreement, and said the United States and South Korea were working on creating a fair and reciprocal trade relationship. Trump's visit to South Korea takes place amid an unprecedented escalation on the Korean peninsula, following several ballistic missile launches and nuclear tests conducted by Pyongyang, whic was followed by harsh statement made by both — Donald Trump and North Korean leader Kim Jong-Un. Media reports suggested that North Korea could hold a new missile test in response to Trump's visit.